Overlooking the beautiful sandy beaches of Las Cucharas on one side and El Jabillo on the other, is the swanky Galeon Playa Apartments, known for its comfy, well-furnished rooms and family-friendly ambience. The self-catering apartments are great for those who are looking for budget accommodation without willing to compromise on quality. This 3-star property features 141 apartments and 34 new Junior Suites, all of which are tastefully designed and equipped with a host of facilities. 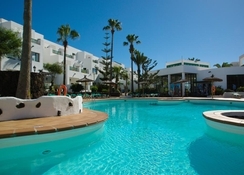 Located at one of the most scenic spots in Costa Teguise, Galeon Playa Apartments offers fantastic views, and is within close proximity to some of the most happening restaurants and bars of the region. Featuring one and two-bedroom apartments, complete with fully functional kitchenettes and en-suite bathrooms, this aparthotel offers a range of flexible packages for its guests. You may choose to cook your own meals at the kitchen space or sample authentic local cuisine at the on-site restaurant of the hotel. With splash-tastic outdoor swimming pools, kids' pools, watersports, golf, entertainment activities and lots more, Galeón Playa Apartments ensure that your stay is fun-filled. 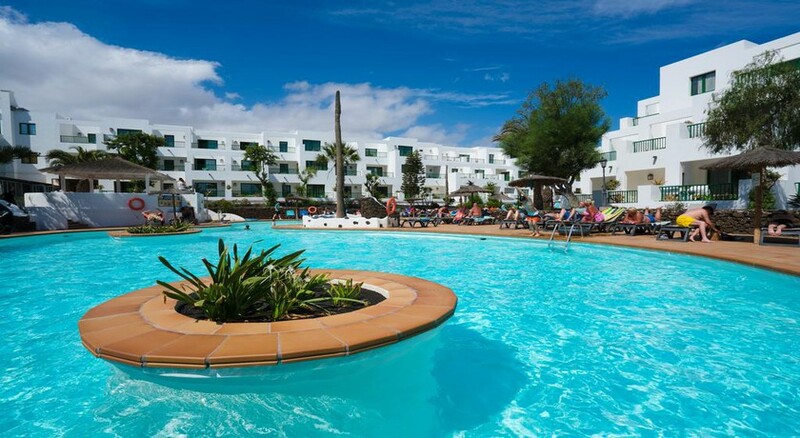 The holiday complex is located at one of the most beautiful spots of Costa Teguise in Lanzarote. It offers the beautiful natural surroundings as well as the hustle and bustle of a busy tourist destination. Golf enthusiasts can rejoice, since the nearest golf course is only 3.5km away. Located by the idyllic Fodele Beach, the resort is blessed with mesmerizing views and is just steps from the sand. The Lanzarote Airport is only 14.6km away from the hotel, making it convenient for the guests to board their flights on time. 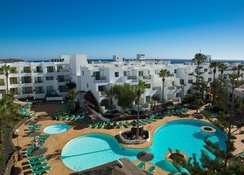 Galeon Playa Apartments has 341 apartments and the junior suites have an excellent location overlooking the gardens and the pools of the hotel. They are categorized as Suites, Superior One-Bedroom Apartment, 1 Bedroom Apartment, Seaview Apartment and Family Two Bedroom Apartment. The decor of the apartments is modern and they feature a host of amenities, such as oven, toaster, microwave, electric kettle and stove. Guests can choose between twin and double beds, depending on availability. Extra bed, crib and high chair can be arranged on request. For large families, the two-bedroom private apartments are the best. They come with separate children bedrooms with bunk beds, tables with games, welcome gifts, crockery and cutlery for children and plenty of other surprises. Looking over to the bay of Las Cucharas, the Restaurante Galeon serves breakfast, lunch and dinner in buffet style. The selection is eclectic and includes a wide variety of international cuisines. For dinner, you are served an exciting array of local dishes and drinks. As for lunch, guests can choose to have a-la-carte meals at the Pool Bar. This bar not only serves light snacks but also mocktails, soft drinks, and cocktails. Galeón Playa Apartments have a lot of family-friendly activities centred around the pools. There are two swimming pools, (one of which is heated in winters) plus two separate paddle pools for kids. Volleyball, darts, table tennis, billiards, and French bowls are quite popular sports among guests. They can also enjoy water aerobatics and water polo games. There is a children’s club, which is categorized into three: Baby Galy (children from 0.6 to 3.99), Galy’s Club (children from 4 to 7.99) and Pirate Club (children from 8 to 11.99). Apart from this, there is a playground and gaming arcades for children. In the evenings, there are different events throughout the week, such as karaoke night, theme dinner, live music, and performances. For adventure junkies, the hotel facilitates windsurfing, sailing, fishing, surfing and kayaking. You can approach the travel desk if you want to go trekking, karting or golfing. We had such an amazing time we are returning this may. Hotel has everything you need, staff very friendly and helpful and shops beach etc within walking distance. We stayed in junior suites. Nice big, clean rooms with a kettle and fridge. Take your own tea and coffee as this isn’t replaced. Great location near shops, bars and the beach. Friendly staff throughout. Nice basic apartments. Clean and excellent value for money.